To ask other readers questions about The Screenwriter's Bible, please sign up. This is a fantastic addition to the aspiring (and maybe accomplished) screenwriter. The book is broken down into sections, which author Trottier states you can read in any order (but suggests you go cover to cover if you can). Mostly I read the book from start to finish, but a few sections I skipped and read at the end. I like that Trottier gives solid examples of proper formatting. But he also gives pointers on how to strengthen a script's story, structure and depth. I like that Trottier gives lots of examples, and that the examples come from various movies from various eras and genres. This book has one of the better explanations of queries that I've come across (some books seem to breeze by this oh-so-important step) and by the time I finished reading about treatments, meetings and pitches, that world didn't seem quite so scary or daunting. I also like that it has a great index, with easy to find sections, so it's a fantastic book to keep nearby when you're writing or editing. This is definitely one of the most thorough books on screenwriting I've read, and it does so without being dry. This book is chock-full-o useful information about how to format your scripts. It might seem like a minor point, and you might have the mindset, "Well, my story is so good, they'll overlook any formatting errors." However, professional script readers have tons of scripts cross their desk and if they see a bunch of formatting errors, they are likely to assume they are dealing with an amateur and may toss your script aside unread. Anyway, Trottier's book is like a Strunk and White's for the screen This book is chock-full-o useful information about how to format your scripts. It might seem like a minor point, and you might have the mindset, "Well, my story is so good, they'll overlook any formatting errors." However, professional script readers have tons of scripts cross their desk and if they see a bunch of formatting errors, they are likely to assume they are dealing with an amateur and may toss your script aside unread. An essential guide for aspiring screenwriters that covers all the bases. Easy to read. I'm sticking with novels for now, but this manual helped me get on track and get going on my next book. I'd only suggest that Trottier use more popular/classic movie examples to illustrate his points vs. his own scripts (Like he did so well with Casablanca). A reader can take away more from his point if they know the material. This book is primarily for people who want to write a screenplay or sell a subsequent screenplay they have written. But it's a testament to David Trottier's writing style that even with this sort of niche format, there's a solid readability that makes this an enjoyable book regardless. The highlight is when he breaks down the outline elements that go into a script, the beats that come up in screenplays across the board. He makes this a pleasant read by using examples from well known films, blendi This book is primarily for people who want to write a screenplay or sell a subsequent screenplay they have written. But it's a testament to David Trottier's writing style that even with this sort of niche format, there's a solid readability that makes this an enjoyable book regardless. The highlight is when he breaks down the outline elements that go into a script, the beats that come up in screenplays across the board. He makes this a pleasant read by using examples from well known films, blending in multiple examples and points of view in a way that avoids its mechanical origins of "this is what you need to write". Subsequent passages are a little more mechanical and craft-heavy, like the extensive notes on script formatting, and the arguably repetitive notes about how to sell a screenplay, but their throughness and accuracy are hard to ignore. Definitely helpful to any aspiring writers. And there's still a bit of writing flow that you don't usually see in books like this. While I'm just a (Very) aspirational screenwriter who has primary experience in college courses and the like, I have also read several of the best known screenwriting books in the business. And I think this is both the most thorough and useful tome in that genre, and the one that gets closest to being an actual book to enjoy. Simply the best formatting guide for screenplays. There is not a better resource and it has a permanant place bside my desktop for finding out obscure rules for formatting. Add on some great advice for writing, and it should be on every writer desk. I actually read this in 2007 when my sister-in-law converted my novel Rendezvous Rock to a screenplay. Both of us knew nothing about writing a screenplay and found it extremely informative. I recommend it for anyone who is contemplating writing their first screenplay. Very informative, especially in regards to formatting. 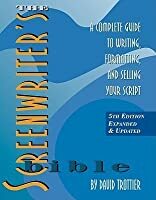 This “Bible” is very informative, detailed, well-organized and accessible; more comprehensive and with a wider range of examples than Syd Field’s classic, Screenplay. On the other hand, it’s nearly 500 pages of 8.5” x 11” text, so it’s formidable. Despite that, it wears its organization on its sleeve and is easy to navigate. Five sections describe and discuss aspects of writing and selling your script. The first three cover basic principles of storytelling, how to write a script (or any compelli This “Bible” is very informative, detailed, well-organized and accessible; more comprehensive and with a wider range of examples than Syd Field’s classic, Screenplay. On the other hand, it’s nearly 500 pages of 8.5” x 11” text, so it’s formidable. Despite that, it wears its organization on its sleeve and is easy to navigate. 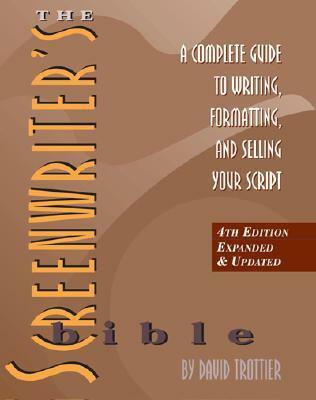 Five sections describe and discuss aspects of writing and selling your script. The first three cover basic principles of storytelling, how to write a script (or any compelling story), and a style guide for scriptwriting – mainly for movies, but also television. A fine section in the middle gives many good and bad script examples with a “scriptwriting consultant’s” commentary. You’d pay thousands to glean this information from an actual consultant, or even to attend a conference with this kind of detail. The last section is on how to sell your script, I believe a far more difficult process than writing it in the first place. I enjoyed the first two sections most, the principles and methods for telling a good story. Trottier’s approach adheres closely to Aristotle’s Poetics, probably still the best how-to-write guide ever written. Trottier is especially strong in simplifying character motivation, and offers some useful worksheets. The Style Guide de-mystifies the arcane rules of formatting a screenplay, and emphasizes simplicity in a spec script, as opposed to a production script. The final section on marketing (sales are presupposed), is daunting indeed. Having marketed several novels I can say that his advice is one-hundred-percent solid. That doesn’t make it any less of a mountain to climb. Despite its overall strong organization, the book is a compendium and often reads like a list of lists, without much connecting tissue. Sometimes topics seem out of order (like introducing the character/action grid after discussion of the draft revision), and sometimes stuff is just inserted at random (like a brief description of a hero’s mythical journey). Actually, all the detailed information you need to execute “Step 6” has been previously discussed, though this is a glaring example of lack of connecting tissue. This “Bible” is more of a reference guide than a step-by-step how-to, but the attentive reader can put it all together and maybe that’s better than trying to follow a recipe. The book is great for beginners. I wish actually I had read it after writing my first screenplay. There are a lot of really essential tips here. Of course today many of the tips appear on Youtube too. But most of them are still only found in books such as this one. Or websites. And it's very well written and to the point. Some of the other books on screenwriting are painfully repetitive. There are really no great book on this topic. Just pick 3 and read them. You won't love any of them but you will learn a bit from them all. There comes a time when you have written enough screenplays to understand what works and what doesn't work in a screenplay. I still make mistakes but they are mostly structure mistakes about making the plot itself work for 90 minutes. Sometimes readers get lost in the story and not the scenes. That's my problem. I tend to get lost in long screenplays. This book doesn't really give you any solution for those more indepth problems. It was nice to get the basics refreshed and I guess I have something I can semi-recommend to new writers. But it's just the very basics. He also keeps linking to his site. And that site has not been updated for 10 years now I assume. It just looks so old. Please someone, write a NEW book on this topic. I'm tired of reading 20 year old books on this topic and seeing writers use examples from movies no one remembers anymore. Also, it's a huge minus that he is not an acknowledged writer and his examples in the book could have been better. I don't know what to think about it. It's a great resource but I still think a better book should be written on the topic. A book that explains how to write a script from A to Z, step by step. And frankly, I was searching for something more deep. This is so basic that you may as well find a website and read about it. This book won't write the screenplay for you, but it can do pretty much everything but that. I've always wanted to enter the screenwriting field, but I've always been fearful of the different formats and expectations from fiction. Trottier's Screenwriter's Bible will explain every single one of these details. If I let fear hold me back now, I can't blame it on ignorance. Every aspect of a screenwriting career is covered in this lengthy volume. It is a giant, unwieldy thing, but what do you expec This book won't write the screenplay for you, but it can do pretty much everything but that. I've always wanted to enter the screenwriting field, but I've always been fearful of the different formats and expectations from fiction. Trottier's Screenwriter's Bible will explain every single one of these details. If I let fear hold me back now, I can't blame it on ignorance. Every aspect of a screenwriting career is covered in this lengthy volume. It is a giant, unwieldy thing, but what do you expect with something that has "bible" in the title? Everything, from developing an idea, to formatting the script, to types of scripts, to studio expectations, to marketing and finding a home for your script is covered. This is one fantastic book. It is written in easy style and formatted logically so college students and embarking on a career in the trade of writing for screen can learn everything they need to know - and I mean everything! Thankfully, it also applies to those who are well-versed in the business of writing stories that are to be made into movies. You can use it as a 'primer' or reminder, a useful book to dip into when you need a memory jogger. Divided into five parts it takes you through the ste This is one fantastic book. It is written in easy style and formatted logically so college students and embarking on a career in the trade of writing for screen can learn everything they need to know - and I mean everything! Divided into five parts it takes you through the steps from writing your screenplay, getting ideas for your story, proper formatting techniques and style - and that all-important element: selling it to the Hollywood system! This was my textbook for a graduate course in screenwriting. Its organization is a bit confusing, but most of the information is on point. Especially useful are the sections on treatments and screenplay formatting. This was a very helpful book. I learned so much. It was fun too. Most of the book is about story, not scriptwriting, but the characters and plots are lifted from films. I have a sense now of a feedback loop, how viewing the story from an eventual script can enhance an original novel. Great advice and detailed steps to help sell your script. Worked with Mr. Trottier on several of my screenplays, this is an excellent book on screenwriting. Simply put, this is the best book on screenwriting I've ever read. Very helpful and simple for beginners. I can't wait to use what I've learned. Perfect reference for any beginner screenwriter. Insightful and a book I will keep with me for as long as I am screenwriting. What are the basics of screenwriting? What does a screenplay look like? What’s the basic format and structure? How do you format things like flashbacks? One of my husband’s co-workers was at square one, he had what he believed was a good idea for a movie, but he didn’t know how to write it. He’d never written or read a script before. I didn't even need to look at my screenwriting books to know exactly which one he'd get the most value from. I went right to this book. The man almost moved cross-c What are the basics of screenwriting? What does a screenplay look like? What’s the basic format and structure? How do you format things like flashbacks? This is a solid screenwriting book for someone new to screenwriting and the most well-rounded book on screenwriting that I've read. Many screenwriting books are gimmicky and/or assume you already have the basics down pat. Trottier is giving us bad information: he's saying that there's a major difference between a spec script and a shooting script. There isn't. The one difference is that shooting scripts have scene numbers for production. Directors don't put in camera angles after the script is purchased. When you see a script with every camera angle in it, it's a Continuity Script, assembled after the film is edited, for copyright and other legal records. Working pros know this, but new writers don't. Trottier's e Trottier is giving us bad information: he's saying that there's a major difference between a spec script and a shooting script. There isn't. The one difference is that shooting scripts have scene numbers for production. Directors don't put in camera angles after the script is purchased. When you see a script with every camera angle in it, it's a Continuity Script, assembled after the film is edited, for copyright and other legal records. Working pros know this, but new writers don't. 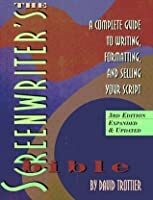 A great resource that covers the many aspects of screenwriting, including the realities of the business side that anyone attempting to shop a screenplay must fully understand. As someone who turned a screenplay into a novel, I recently went back to update and polish the spec my novel was based on. Reading the "Bible" again has been a great refresher course. 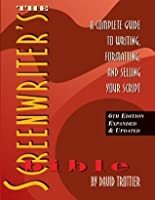 If you're already grounded in story structure, screenplay formatting, and the business end of Hollywood, I highly recommend getting David's T A great resource that covers the many aspects of screenwriting, including the realities of the business side that anyone attempting to shop a screenplay must fully understand. Although no books can completely solidify the experience, from one perspective, of collaborating and producing a film, this manual has all the techniques answering a newbie's questions in regard to screenwriting. If only one book is acquired, or even a first book, for the subject of screenwriting, this should be the first one purchased. I have two shelves of screenwriting books and manuals, and two of them are this title. One of them is so marked up, highlighted and dog-eared, I keep it for note Although no books can completely solidify the experience, from one perspective, of collaborating and producing a film, this manual has all the techniques answering a newbie's questions in regard to screenwriting. If only one book is acquired, or even a first book, for the subject of screenwriting, this should be the first one purchased. I signed up on scriptfrenzy.org to write a screenplay this month. So far I am behind by roughly 2,521 words (the site suggests writing 667 per day to achieve the 20,000 word count by the end of June). Don’t people say that admitting goals publicly (or on goodreads) is a way of motivating/shaming oneself? In any case, this book seems like a good resource so far, though perhaps it’s time to stop reading and try writing (isn’t that always the case?). This book truly lives up to its title. Any and every question I have had about writing and distributing screenplays, I have found a relevant answer to. The writing is unfettered by unfamiliar jargon, plainly communicated, ans liberally sprinkled with examples. I keep this book on hand at all times. 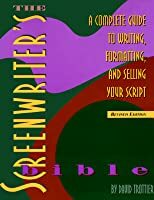 If you are new to writing screenplays, or looking for some fresh tools to incorporate into your current screenwriting endeavors, I highly recommend this book. This was the textbook I had to buy for my very first screen writing class about 4 years ago. And I still use it for reference from time to time not to mention have I yet to find a better ref style book for Hollywood Screen writing. This is well written, well organized and easy to understand. The workshop method will have you writing in no time and before you know it you will be finishing a script. Great book for all screen writers.